Why are the Helper help time preferences not displaying correctly when making changes? 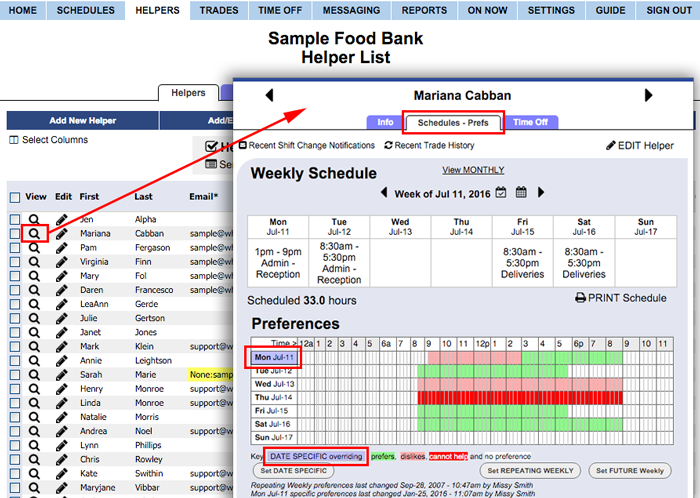 If you are changing a Helper's preferences and they do not seem to be displaying correctly, check that the dates do not have any DATE SPECIFIC preferences added. DATE SPECIFIC preference always override the REPEATING preferences. On the Helper Details>Schedules tab you will see the date background shaded on days that have DATE SPECIFIC preference overriding the REPEATING type of preferences . (See circled date below). In this example, May 23rd has been set as different than Repeating and is set to Prefer All Day, so matter how the REPEATING WEEKLY are set that will be overridden. To change a date specific preference, click the shaded date or click the Set DATE SPECIFIC PREFERENCES button in the bottom left.